Croton nuts could become a new biofuel, giving farmers in Kenya another source of income. 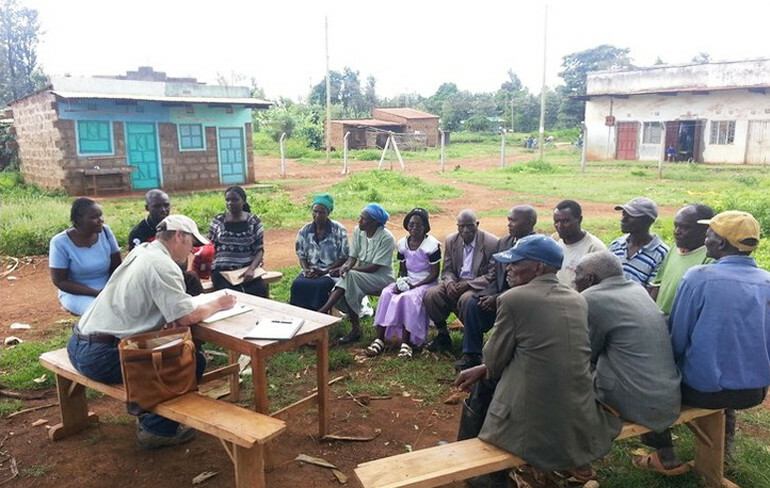 Croton trees—which seem to grow everywhere in Kenya—and the oilseeds they produce have the potential to improve rural livelihoods, says forest economist Michael Jacobson, professor of forest resources in the Penn State College of Agricultural Sciences. Through the production of oil for energy and co-products, such as animal feed and organic fertilizer, croton represents an opportunity many poor farmers are eager to take. That is the conclusion Jacobson reached after surveying hundreds of Kenyan farmers and meeting with them in villages across four counties in the central region of the country. The objective was to assess household preferences for planting and cultivating croton trees for collection and selling of nuts to a growing market. Researchers gathered and analyzed demographic data on income, household size, age, other occupations, and village from farmers to determine if those factors influence their preferences. Farmers were presented with production scenarios and asked to make choices depending on seedling cost, oilseed yield, tree-maturation period, labor needed for seed collection and seed selling price. Results show that almost all households have croton trees on their land and are willing to produce croton nuts. More importantly, Jacobson notes, most would be willing to plant more croton trees. The research stems from the World Agroforestry Centre’s examination of the sustainability of the infant croton-tree value chain in Kenya with the intent to support its up-scaling. Initial studies indicated the business holds significant potential for generating additional income and improving local livelihoods, without jeopardizing the environment. The international organization invited Jacobson to assess whether small farmers could play a significant role in the scale-up of the business. “To ensure economic sustainability in the long term and scale-up the value chain, a consistent, reliable, and economical supply of seeds must be secured to support large bio-refineries,” Jacobson says. Findings of the research, which appear in Forest Policy and Economics, provide guidance for the development of a croton value chain that Jacobson believes biofuels entrepreneurs will use in their business plans. Falling prices of diesel fuel have hampered development of the croton biofuel industry. One company that has been trying to develop the market and produce croton biofuel, Eco Fuels Kenya, is struggling to find support. Jacobson has worked with that company’s management to help them understand ecological conditions that affect the planting of croton and the profit potential for byproducts. Additional researchers from Penn State; the University of Leuven, Belgium; and World Agroforestry Centre, Kenya contributed to the work. The World Agroforestry Centre and the International Fund for Agricultural Development, through the Program for the Development of Alternative Biofuel Crops, supported this work.